Obvious troll is obvious. The useful prototypes are still in, the salvage that everyone has hundreds or thousands of aren’t. Please don’t encourage putting challenge gear back into raid rewards. How many G12 toons do you have? 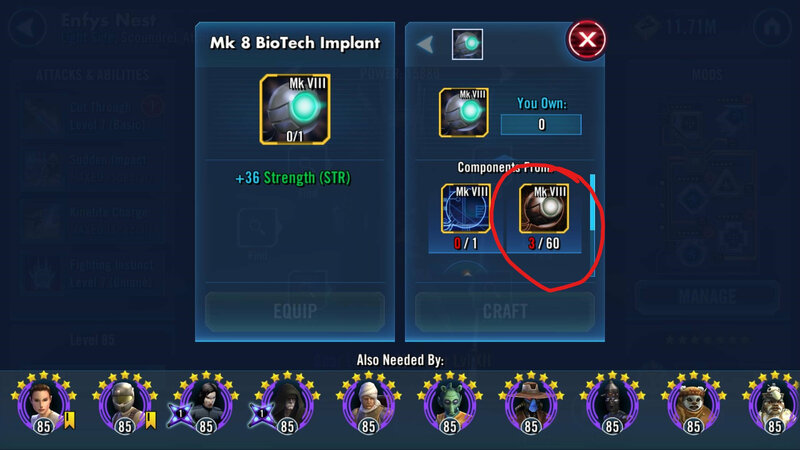 I have 28 G12 toons, which doesn't count the full eyeballs I just gave to G11 Han (2) and Chewie (1). I have under 100 of each piece now. If you read the forums at all you'll see lots of other people in the exact same position. I have 28 too and I have 1200 spare salvage from challenges and AAT before it was changed. There was nothing worse than getting useless challenge salvage in rewards for me. I need at least 30 full balls just for my current gears on available toons. Of course not all of them will ever receive one but by the time I get enough prototypes to make 20 balls and use up all my original 1200 salvage, I’ll have probably received at least another 600 salvage from challenges. My main source of prototypes are the various shops and the occasional 375 crystals for 25 is a relative bargain. This doesn’t even matter too much in the long run either because g12+ require prototype balls, not salvage. We don’t really need challenge salvage gear as raid rewards. I’d take prototypes over salvage anytime. Gear crunch is always an issue. You’ll be bottlenecked by several pieces briefly but you’ll soon get past it and start stockpiling hundreds and thousands whilst the usual culprits are always needed I.e. stun cuffs, guns etc. Gold ball salvage is not a real bottleneck which i think is why there was a demand to remove them amongst others from raid rewards and get more of the stuff that’s more important. It's not just about the G12 toons, it's which G12 toons. Raid Han requires 300. Revan requires none. Things that are useless to some are not useless to all. You also need 200 carbanti and stun guns, as well as 150 cuffs then also raid gear such as 150 furnace salage (plus 150 hairdryers), 50 frisbees, 50 security scanners, 100 mk4 bactas and 100 mk4 holos. Seriously gold ball salvage is one of the most easily attainable of those. I’d be quite surprised if it took me longer to get 300 gold ball salvage before those 1000 pieces of mostly raid gear is ready. Han is a hard gear too. Most gear is meant to be a bottleneck, many people have complained about carbanti, guns, cuffs etc since time began. Many have lamented some of the easily attainable challenge gear as raid rewards and the devs have addressed this and they’ll probably have backed it up with data to ensure the majority do actually benefit. Because let’s face it, gold ball salvage is not one of the more significant gear bottleneck compared to the others. Plus they’re not needed for g12+. I can imagine if they brought salvage back as raid rewards, in a couple of months people complaining about gold ball salvage will be complaining about the gold ball prototype struggle instead and asking for the salvage to be removed. Actually i was in your position, having hundreds if not thousands. But they are consumed more often then they come. I'm at 240 right now and i can see myself without them. Realistically you can get 60 in a week (20/ chaenge day). I remember when these were removed from raid rewards. I too was wondering how the hell are people running out of these salvages? I had almost 2000 pieces at the time of the removal. I wanted more of those eyeball components instead. At the time I never bothered to do the math to figure out why salvages might be so important down the road. Please put these back in rewards! You would need to farm 9,600 salvages to gear all the characters that need these pieces. Subtract 60 pieces for every full eyeball you get as a raid reward, or if you buy a full piece from the store for 2000 crystals! I value those salvage pieces more than carbantis. They are simply more difficult to obtain. It’s my bottleneck right now.